Home > Food Facts > Milk & Dairy > Can Eating Too Much Yogurt Have Any Side Effects? Can Eating Too Much Yogurt Have Any Side Effects? Yogurt contains a good amount of calcium. It helps protect against osteoporosis and helps maintain muscles. It also helps to improve digestive health and boosts the immune system. So, does that mean you can go for a yogurt overdose? Is too much yogurt bad for you? To answer these questions, we should first take a look at yogurt nutrition facts. Is Too Much Yogurt Harmful? Yogurt is a good source of proteins, vitamins, minerals, and fats. An eight-ounce serving of plain, full-fat yogurt contains 140 calories. It has eight grams of proteins, 7.5 grams of fat, and 11 grams of carbs in the form of sugar. The biggest problem with yogurt doesn’t lie in its overconsumption, but with the toppings, flavorings, and additives used, as well as the excess processing of milk. Toppings like frozen and preserved blueberries, strawberries, or other fruits contain added sugars. Sometimes canned fruit pulp is added to the yogurt instead of fresh fruit. Also, it contains added colors and flavorings that are chemical-based. All these aspects differ with the brand. Consuming yogurt in moderation is extremely healthy, and it should be a part of your daily diet. But, having too much of it may be harmful in terms of excess sugar, and it may cause allergies in certain people. Here are five possible side effects of eating too much yogurt. The high amount of calcium from yogurt can make you prone to kidney stones or prostate cancer. Eating too much yogurt may also reduce the absorption of iron and zinc, which may result in calcium buildup in your blood vessels. However, this applies in the case of excess consumption over a period of time. Calcium is a necessary mineral we require for bone and teeth health, and much more. We get a good amount of calcium from milk and milk products including yogurt. A cup of whole milk plain yogurt contains 296 milligrams of calcium. According to the Physicians Committee for Responsible Medicine, a type of sugar called galactose, which is found in yogurt and produced from lactose, may cause ovarian cancer. Dr. T. Colin Campbell, the author of The China Study, has found that a diet high in animal proteins may cause cancer. The basic ingredient for making yogurt is cow’s milk. Cows are given antibiotic medicines and hormones in their feed. One such hormone which increases the milk production in cows is recombinant bovine growth hormone (rbGH). Another hormone added to cattle feed is IGF-1. High levels of IGF-1 in the human body may cause breast and prostate cancer. Consuming yogurt along with certain antibiotics will decrease their effectiveness. For example, yogurt may decrease the amount of the ciprofloxacin antibiotic our bodies absorb. The same applies to tetracyclines as the calcium in yogurt binds with tetracyclines in the intestine. Consuming yogurt along with immunosuppressants may cause you to fall sick because these medications decrease our body’s immunity, making us susceptible to infections. Since yogurt mostly contains live bacteria and sometimes yeast, eating too much yogurt causes yeast infections. According to an article published in The American Journal of Clinical Nutrition, having too much of yogurt can lead to increased weight. Sweeteners such as aspartame and high-fructose corn syrup (HFCS) are added to yogurt. HFCS has a high glycemic index, which can spike the blood sugar. Aspartame contains methanol, which is toxic even if consumed in small doses. Also, commercially processed yogurt has flavorings and additives. According to a study on women published in the journal Gastroenterology, consuming probiotic yogurt twice a day impacts brain function. The study showed that consuming probiotic yogurt reduced brain activity in the most critical regions. However, the study also showed stronger neural connectivity between the periaqueductal gray to the prefrontal cortex. This area of the brain helps in decision-making. These are the side effects of consuming too much yogurt in adults. Read on to know the side effects of too much yogurt for your baby and young children. As mentioned, cattle are injected with growth hormones to promote growth and increase the amount of milk they produce. If children consume yogurt made from such milk, it may lead to early puberty. It may also lead to an increase in hormones and cancer, according to Healthy Child Healthy World. A container of yogurt has up to 26 grams of sugar. The American Heart Association recommends children aged between four and eight years to consume not more than 12.5 grams of sugar per day. A cup of yogurt contains eight grams of proteins. The Institute of Medicine and the American Academy of Pediatrics recommend 11 grams of protein per day for babies aged seven to 12 months and 13 grams per day for toddlers. Too much yogurt can also lead to weight gain in children. How Much Yogurt Is Too Much for Consumption? How much yogurt you can consume depends on the type of yogurt you choose. It also depends on your age, weight, genetics, and physical activity level. Harvard University health researchers recommend women consume a maximum of two servings per day. Different varieties of yogurt differ in calories, proteins, fats, and sugar content. Yogurt is a dairy product and how much yogurt you consume can be calculated depending upon recommended daily dairy consumption. You should consume yogurt such that it doesn’t increase the recommended daily calorie intake. The U.S. Department of Agriculture recommends consuming low-fat or non-fat yogurt. Also, be sure to avoid flavored yogurt as it is high in sugar. You can make your bowl of yogurt healthy and satisfying. Just add some fresh fruits for sweetness and fiber, as well as nuts and proteins to increase its nutritional value. Having said that, eating the right amount of plain yogurt has tremendous health benefits. You can have it plain or use it in recipes. You should try making yogurt at home as much as possible. It is a fairly simple process. By making your own yogurt, you know that the milk you are using doesn’t contain any added artificial flavoring. Also, try to ensure the milk comes from grass-fed cows. You can try it out with goat milk as well. 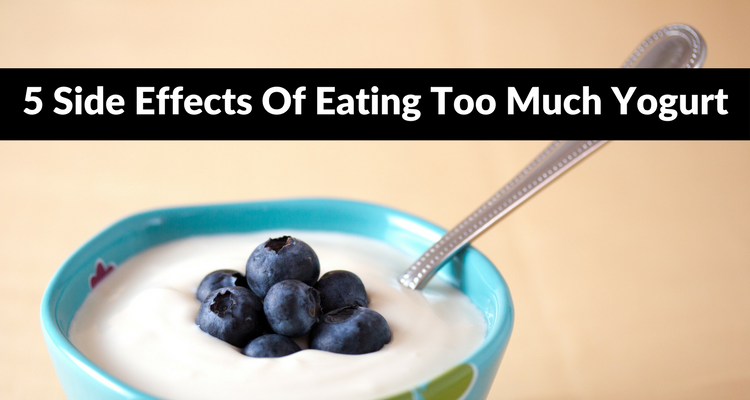 Just like an excess of everything else, eating too much yogurt is harmful. So, moderation is key. And a couple of servings of yogurt per day can give you ample benefits. “Can You Get a Yeast Infection from Eating Yogurt?” Probacto, July 9, 2013; http://blog.probacto.com/can-you-get-a-yeast-infection-from-eating-yogurt/#. Maxwell, C., “Don’t Overdose on Probiotics,” Ask Dr. Maxwell, April 16, 2014; https://www.askdrmaxwell.com/2014/04/dont-overdose-probiotics/.